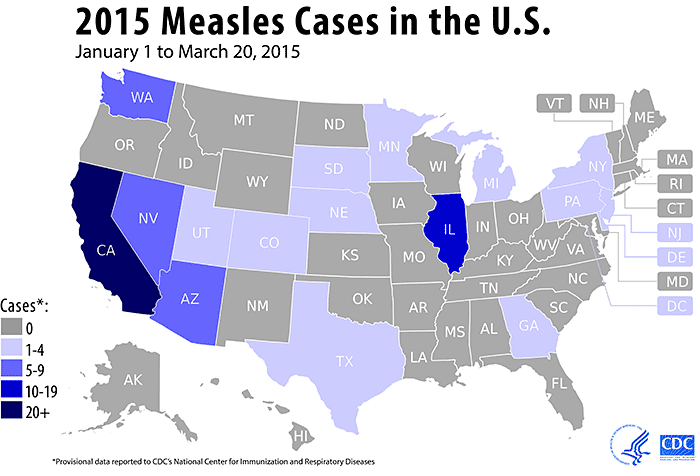 From January 1 to March 20, 2015, 178 people from 17 states and the District of Columbia were reported to have measles [AZ (7), CA (120), CO (1), DC (2), DE (1), GA (1), IL (15), MI (1), MN (1), NE (2), NJ (2), NY (3), NV (9), PA (1), SD (2) TX (1), UT (2), WA (7)]†. Most of these cases [131 cases (74%)] are part of a large, ongoing multi-state outbreak linked to an amusement park in California. Includes chart: U.S. Measles Cases by Year, 2001-2015.